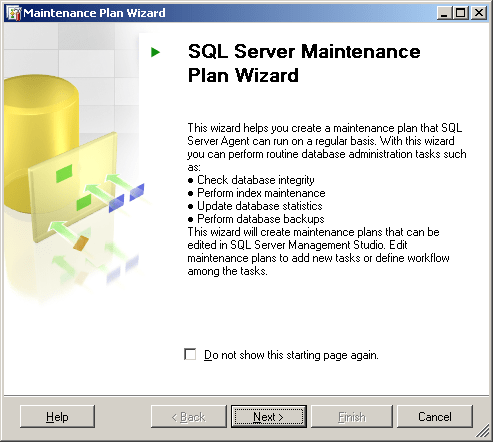 In this article example (which is showing SQL server 2008 based example), i will show you how to create new SQL Maintenance Plan that will contain few of the above options, you can either select these all options or any one or as per your requirements. Open the Management folder then right click on Maintenance Plans. Enter a Name for this maintenance plan. Optionally, enter in a description. Click Change in the Schedule section to change the schedule. The Job Schedule Properties screen displays. Schedule type to Recurring and select Enabled. Recurs every to 1 week(s) on then select the day of the week, for instance, Sunday. Click OK to close the job schedule properties, then click Next on the Select Plan Properties screen. On the Select Maintenance Tasks screen, select the boxes shown with checkmarks below then click Next. Set the order of execution in the Maintenance task Order screen as shown below. Use the Move Up and Move Down buttons to reposition the task (up or down) in the list. Select All databases and select Include indexes in the Define Database Check Intgerity Task window. Note: In this example, I am selecting all the databases, you can select only the one you need. Click Next. The Define Shrink Database Task window displays. Select All databases, in the Databases field. Set the Shrink database when it grows beyond to 50MB. Set Amount of free space after shrink to 10%. Select Return freed space to the operating system. Click Next. The Define Reorganize Index Task window displays. Select "All databases/All user database", in the Databases field and select Compact Large objects. Click Next. The Define Rebuild Index Task window displays. Select All databases, in the Databases field and select Reorganize pages with the default amount of free space. Click Next. The Define Update Statistics Task window displays. Select All databases, in the Databases field and select All existing statistics and Full Scan. Click Next. The Define Back Up Database (Full) Task window displays. For Back up to:, select Disk. Select Create a backup file for every database. Click Next. The Define Maintenance Cleanup Task window displays. For Delete files of the following type: select Backup files. Enter bak for the File Extension. Select Delete files based on the age of the file at task run time. Indicate Delete files older than by the number of days or week you want to keep the back file(s). Click Next. The Select Report Options window displays. Select Write a report to a text file. For folder location choose a path to save the maintenance report files, for example: C:\AllUserDatabaseBackups\Reports, or choose the default location. Click Next. The Complete the Wizard window displays. This allows you to verify all steps of the maintenance task. When approved, click Finish. After clicking the Finish button SQLServer creates the maintenance task. If everything is successful you can close the window. Right-click the maintenance plan you created then click Execute. This will vary depending on your needs, but here are some common guidelines for how often to schedule tasks.